Wild salmon is a rich source of niacin, which helps reduce the risk of cataracts. See recipe below. (CookingLight) -- We've all heard that carrots play a huge role in overall eye health but what else can you eat to improve the health of your eyes and reduce the risk of disease? To keep your eyes in top shape, follow many of the same guidelines suggested for maintaining a healthy heart like keeping your blood pressure and cholesterol in check, reducing saturated fat from the diet, taking control of your weight, and increasing your antioxidant intake. Start now by eating nutritious and vitamin-rich foods to reduce the risk eye disease, improve sight, and maintain good eye health. The carotenoids lutein and zeaxanthin found in green leafy vegetables like spinach, Swiss chard, collards, and kale help to improve vision and reduce the risk of age-related macular degeneration. The antioxidants in these foods act as natural sunglasses to defend the eyes from ultraviolet radiation as well as protect cells from being damaged. Among the top sources of antioxidants, berries play an important role in decreasing cancer risks, cardiovascular disease, and Alzheimer's disease. Studies have also found the antioxidants in berries reduce the risk of macular degeneration, cataracts, and other eyes diseases. Choose fresh strawberries, blueberries, or raspberries for a sweet snack, simple dessert, or salad topper. Milk is a good source of riboflavin and can help to reduce your risk of cataracts. It is also fortified with vitamin A, a leading performer among eye health vitamins. Choose low-fat milk over whole milk to keep the saturated fat low and prevent plaque buildup in the eyes' blood vessels. Cheese, eggs, and liver are other good animal sources of vitamin A. Lean beef is an excellent source of the mineral zinc that helps the body absorb antioxidants and fight disease. Studies have found a relationship between zinc intake and eye health, particularly retina health. Choose lean cuts to reduce the overall saturated fat from your diet. Increase the zinc in your diet by choosing cheese, yogurt, pork, turkey, and fortified cereal. Omega-3 fatty acids like the ones found in fatty fish play a key role in retina health and help reduce the risk of macular degeneration. Aim to eat at least two weekly servings of fatty fish such as salmon trout, mackerel, sardines, or herring. 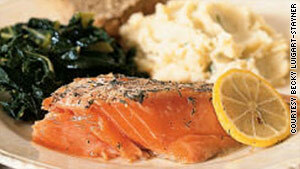 Wild salmon is also a rich source of niacin, which helps reduce the risk of cataracts. Another antioxidant that's critical in eye care is vitamin E from nuts, mangoes, broccoli and healthy oils like wheat germ, safflower, corn, and soybean. Vitamin E has been found to prevent and delay the growth of cataracts, so snack on almonds or cook your veggies in one of these good-for-you oils to get a jump-start on healthy eyes.